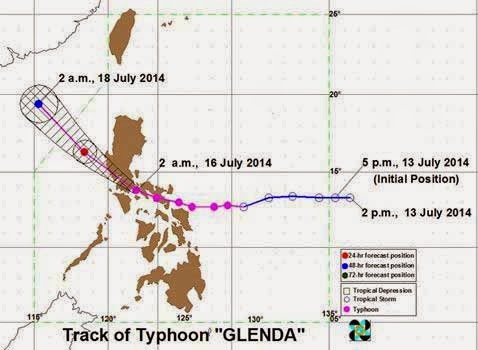 Update on Typhoon Glenda (Bagyong Glenda) as of Wednesday, July 16, 2014 based on the forecast of state weather bureau PAGASA. At 7pm, its eye was spotted at 240 kilometers West Northwest of Olongapo City with maximum sustained winds of 140 kilometers per hour near the center and gustiness of up to 170 kph. The typhoon is forecast to move West Northwest at 24 kph. Public Storm Warning Signals elsewhere are now lowered, state forecasters said. Fishing boats and other small seacrafts are advised not to venture out into the western seaboard of Luzon. The public and the Disaster Risk Reduction and Management Council (DRRMC) concerned are advised to take appropriate actions and watch for the next bulletin, PAGASA added.